When you have lost your natural teeth, a variety of complications can arise that impact your physical and emotional health – beyond just your smile. You may find it difficult to speak clearly or chew your favorite foods. You may be embarrassed and may try to hide your smile from others. You may also experience shifting among your remaining teeth, causing additional discomfort in your mouth and jaw, possibly leading to muscular issues or headaches. Dentures are an important part of restoring your smile’s appearance, but they can pose challenges for some. 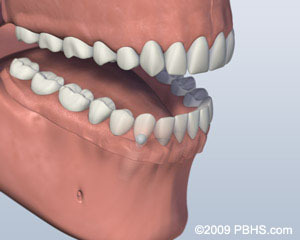 DDS Dentures + Implant Solutions® can give you a solution that provides comfort and relief. Implant retained dentures can replace both upper and lower teeth, giving you a secure, natural-looking option that is not only more comfortable but also more convenient than traditional dentures. Let DDS Dentures + Implant Solutions® help you determine the right type of implant retained denture for your unique needs! Call 844-693-3688 for a consultation appointment today! 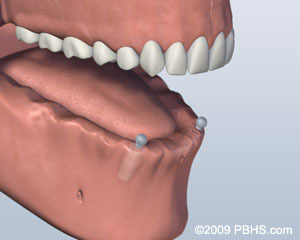 A ball attachment or locator-attached denture is an implant retained solution to replace lower teeth. 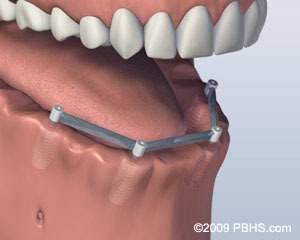 This type of denture utilizes as few as two dental implants as anchors for the denture. A full set of lower dentures snaps into these anchor points, giving you teeth that allow for more natural function since they shift less than traditional dentures. Some soreness and some shifting are still possible, so it’s important to trust a team like DDS Dentures + Implant Solutions® to fit your dentures and provide any necessary adjustments over time. It’s also important to keep your dentures clean, especially from debris like crumbs or seeds, as they can cause discomfort. Screw-retained dentures are among the most permanent teeth-replacement options for those needing a full set of lower dentures. 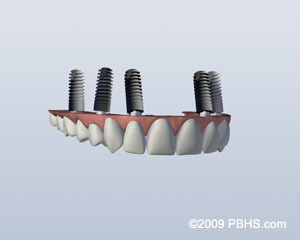 This type of implant supported denture uses four or more implants in your lower jaw. The complete set of dentures is affixed to these anchors with screws, meaning they are exceptionally secure – they also will not be removed for daily cleaning. Instead, you will be able to clean around and under the teeth, along your gums. This cleaning is more challenging for some, but the overall solution provides a more permanent experience. Your DDS Dentures + Implant Solutions® dentist will still remove this type of denture to maintain their quality and fit during your regular maintenance visits. The bones in your upper jaw differ from those in your lower jaw, however, those needing a complete set of upper dentures still have a variety of solutions. In some cases, dentures can be placed in such a way as to eliminate the need for the dental appliance to extend across and cover the roof of your mouth. This gives you a more natural experience when you eat or speak. Upper dentures that are retained by implants are less likely to shift, just like lower dentures, and are similarly removable for cleaning or maintenance. As always, a custom fit is required, so trust DDS Dentures + Implant Solutions® to serve you! 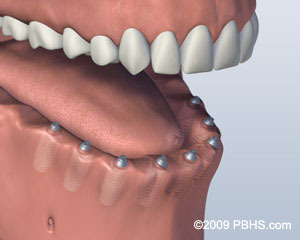 Improved Confidence Implant retained dentures look and feel more like natural teeth. Stability During Eating Thanks to multiple secure anchor points, implant retained dentures are less likely to shift in your mouth when you eat. Bone and Gum Preservation By keeping the supportive structures of your mouth engaged, implant retained dentures help preserve your function and appearance. 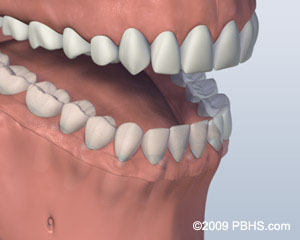 Improved Dental Hygiene Implant retained dentures may be a more hygienic tooth-replacement solution for many patients. 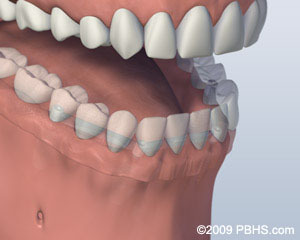 Improved Esthetics Implant retained dentures are customized to fit the natural look of your face and smile. Nutritional Benefits Implant retained dentures allow you to eat a more well-rounded diet. Implant retained dentures are more affordable than you may think, and may provide long-term savings when it comes to giving you a more permanent solution to missing teeth. Plus, with DDS Dentures + Implant Solutions®’ Price Beat Guarantee, you are assured to pay less than our competition advertises for similar services. We also offer a variety of payment options including options for financing your dentures. Together, let’s determine the right solution for your smile and your pocketbook – a solution that may include implant retained dentures. Find a DDS Dentures + Implant Solutions® location near you.